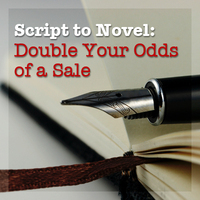 OnDemand webinar on adapting your screenplay into a publishable novel. Learn methodology for identifying critical scenes, and how to create a more compelling story, engaging characters, and evocative setting for the novel. Learn how to leverage your story’s potential in both film and literary markets to effectively double your odds of a sale. Today’s screenwriters are finding fewer opportunities to take their creative work to the film industry and even less opportunity to stay attached to their work when bought. Yet, even in such times, under such circumstances, options and strategies exist to develop and advance a screenwriter’s career—perhaps the best being novelization. Published novels and non-fiction books stand a much better chance of getting read by Hollywood for source material than spec scripts in today’s market — and a published author stands a better chance of staying attached and getting that “screenplay by” credit when their book is optioned by Hollywood. Now, determined to find their audience and another way to the silver screen in a tight economy, screenwriters are learning that having both a novel and screenplay version of their story makes them more attractive to Hollywood than ever, increasing their odds of a sale in both literary and film markets. The OnDemand version of this webinar does not include a critique or bonus ebook.